View of "Yinka Shonibare MBE : Pièces de résistance", 2015, DHC/ART Foundation for Contemporary Art, Montreal. Front, back, left to right : The Age of Enlightenment – Immanuel Kant, 2008; Fake Death Picture (The Death of Chatterton - Henry Wallis), 2011; Fake Death Picture (The Death of Leonardo da Vinci in the Arms of Francis I – François-Guillaume Ménageot), 2011; Fake Death Picture (The Suicide – Manet), 2011. Photo: Richard-Max Tremblay. 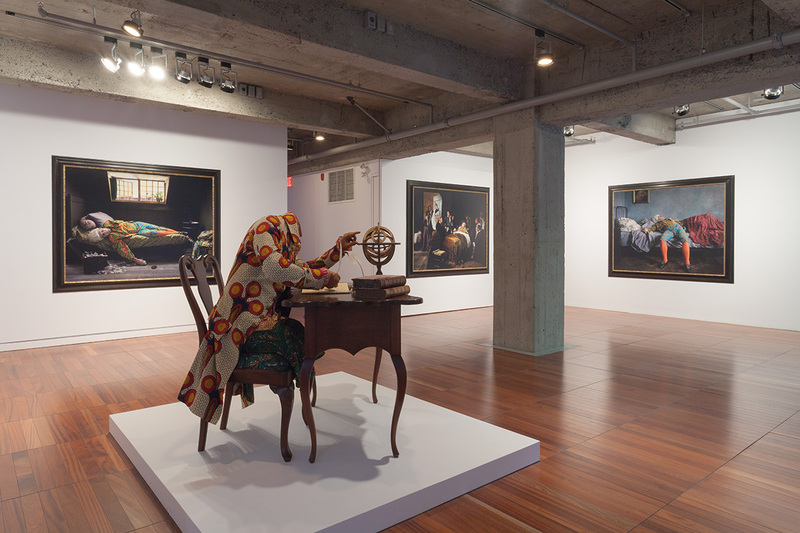 View of "Yinka Shonibare MBE : Pièces de résistance", 2015, DHC/ART Foundation for Contemporary Art, Montreal. Pointe Shoe (Odette) I, 2006. Photo: Richard-Max Tremblay. 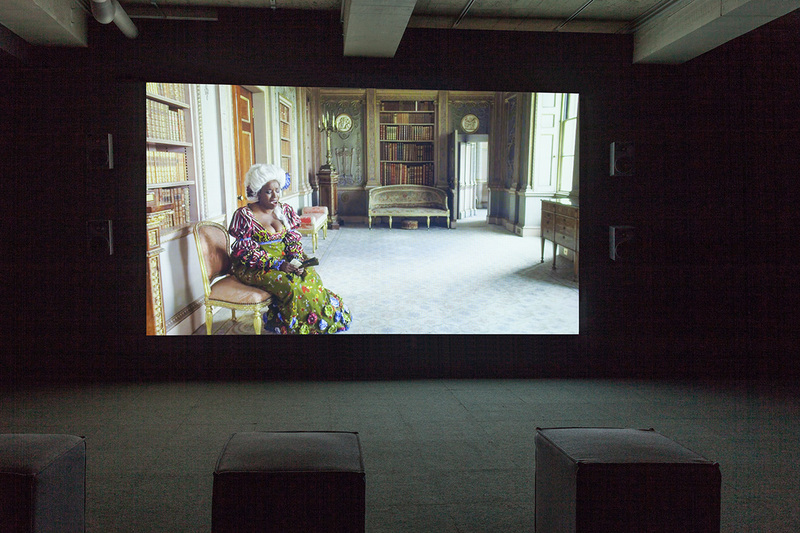 View of "Yinka Shonibare MBE : Pièces de résistance", 2015, DHC/ART Foundation for Contemporary Art, Montreal. Left to right: Homeless Child 3, 2013; Self Portrait (after Warhol) 2, 2013; Self Portrait (after Warhol) 1, 2013. Photo: Richard-Max Tremblay. View of "Yinka Shonibare MBE : Pièces de résistance", 2015, DHC/ART Foundation for Contemporary Art, Montreal. Un Ballo in Maschera (A Masked Ball), 2004. Photo: Richard-Max Tremblay. View of "Yinka Shonibare MBE : Pièces de résistance", 2015, DHC/ART Foundation for Contemporary Art, Montreal. Addio del Passato, 2011. Photo: Richard-Max Tremblay. 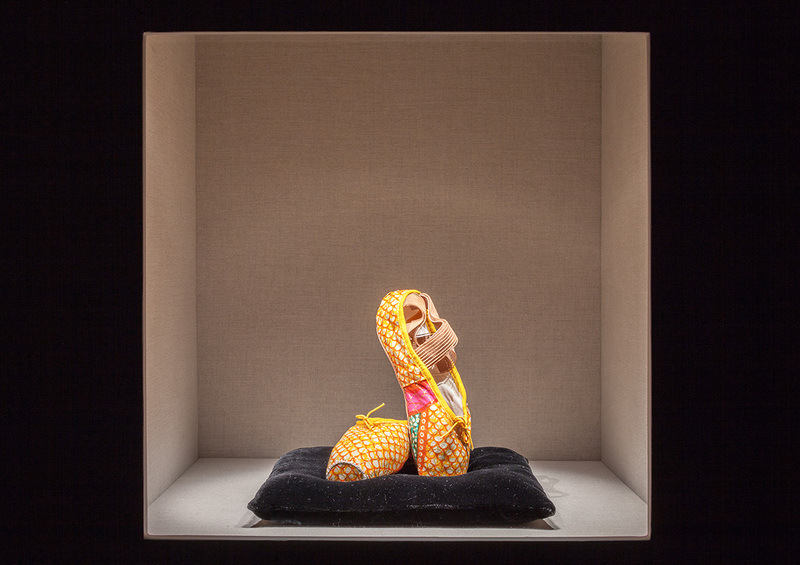 This summer, Montreal’s DHC/ART Foundation presented Pièces de résistance, Yinka Shonibare’s first major solo exhibition in Canada. 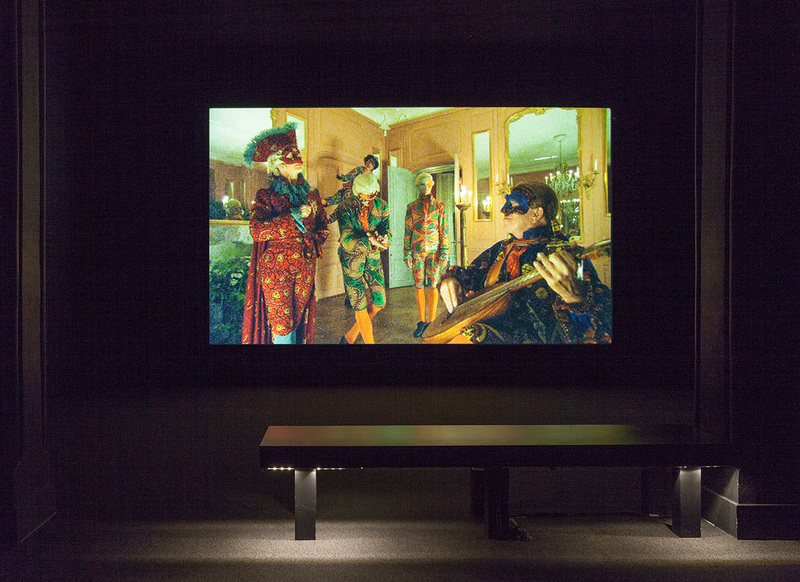 The Goldsmiths graduate and member of the Young British Artist (YBA) generation gained widespread attention with his Documenta 11 installation Gallantry and Criminal Conversation (2002), a scandalous reimagining of the 17th and early 18th Century tradition of the Grand Tour. 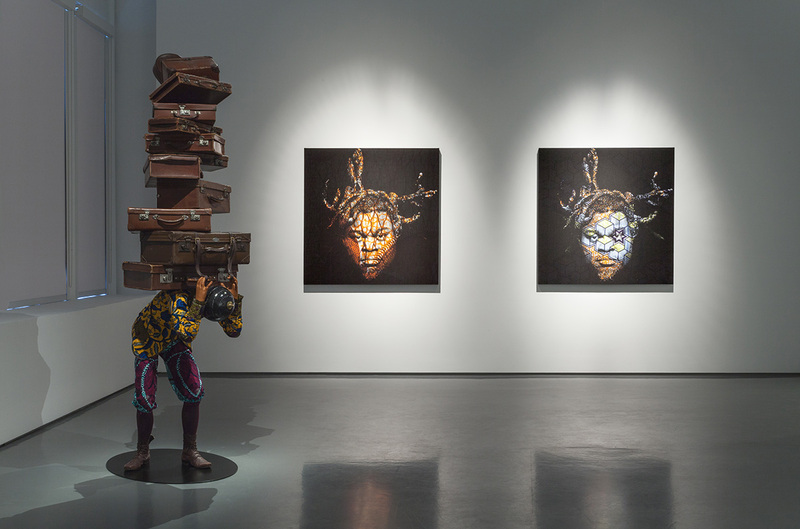 Since then, the Nigerian-British artist has made work for museums, galleries, and public projects all over the world. 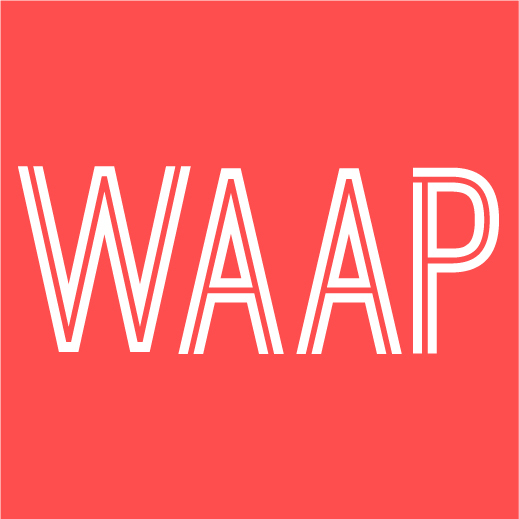 The sculpture, painting, photography and film in Pièces de résistance focus on the era of European colonial expansion, during which exorbitant wealth flowed back to Europe from the trans-Atlantic slave trade and the industry of the colonies. Each piece recasts elements of European culture and history in the colourful prints of Dutch wax fabric. This brightly-patterned cloth, embraced by West African markets, was mass-produced by the Dutch based on Indonesian batik designs. In Shonibare’s work it indicates the interconnected global politics that have grown steadily since the 15th Century, when European “explorations” began. The success of the ensuing colonizations was built on a nascent capitalist system, and buttressed by exclusive white male philosophical conceptions of humanism in the development of western modernity. Despite immediate appearances, the works in this exhibition are not about African cultures, or even Blackness, but rather Europe’s construction of itself as white. With decorous grandeur, they systematically subvert Eurocentric assumptions in history, philosophy, and art. Shonibare’s works are all perfectly composed. Nelson’s Ship in a Bottle (2007), for instance, is a meticulously rendered maquette of British naval hero Lord Nelson’s ship, with sails of Dutch wax fabric. Elsewhere, in the film Addio del Passato (2011), we see Frances Nisbet, Lord Nelson’s cuckolded wife. In a Victorian dress of colourful Dutch wax fabric, the wealthy white Caribbean woman is performed by a black actress who sings an Italian opera about her broken heart. The Sleep of Reason Produces Monsters (2008) is a series of photographs referencing Francisco Goya’s classic print. Five nearly identical versions correspond to five of the continents. In each one, a different man is slumped over at a desk, decked out in a Dutch wax fabric outfit. Self Portrait (after Warhol) 1 (2013) is a close up of the artist’s face overlaid with a Dutch wax fabric pattern, modeled after the pop icon’s camouflaged 1986 self-portrait. This image calls to mind the African American artist Jean-Michel Basquiat, who had a troubled artistic and personal relationship to Warhol. Shonibare’s works, however, have none of the detail or inter-textual depth that characterized Basquiat’s invocation of the legacies of capitalism and slavery. Aside from Dutch wax fabric, all of the references in the exhibition are strictly European. Pièces de résistance makes a powerful point. Unfortunately, what is at first mesmerizing becomes tedious. The tactic of using Dutch wax fabric is quite literal. Beyond the easy pleasure of its beauty, there is no shock to what the work infers. It would take very willful denial indeed, at this moment in time, to still be surprised or enlightened by the cavernous omissions in Europe’s conception of its own cultural history. Yaniya Lee is a writer and interviewer based in Toronto. Exhibition Reviews are you experienced?